Credit Unions don't pay taxes! They're trying to steal our business customers! I often quote Sun Tzu from his over 2,000 year old book, The Art of War. One of my favorites: "If you know the enemy and know yourself, you need not fear the result of a hundred battles." The frequent and resource sapping waling about credit unions tells me that banks don't know their enemies, umm, competition. Last year I attended the CUNA Government Affairs Conference (GAC). By the way, it was the trade show beyond all trade shows. Clearly credit unions put heavy resources into lobbying. So I will give banks that point. We had a booth, and my company's tagline is "helping banks perform better". We like the alliteration, and use the word "banks" in a generic way, like Kleenex. But one would think we would hear about it from CU executives and trustees. And we did hear some quips. But one CEO opined that the rift between banks and CUs was greatly exaggerated by trade associations to keep the masses engaged. I believe her. Why? Take my home state, Pennsylvania, for example. We do business with both banks and CUs in the state. Admittedly, mostly banks. And we hear plenty about credit unions in strategy sessions. But I pulled deposit market share data for the state, and the results are telling (see table). Credit Unions boast a 9.5% deposit market share in the state, or $33 billion out of $345 billion total. There are 497 credit unions headquartered in PA, but 447 of them are less than $100 million in deposits (ok, shares for you CU technocrats). 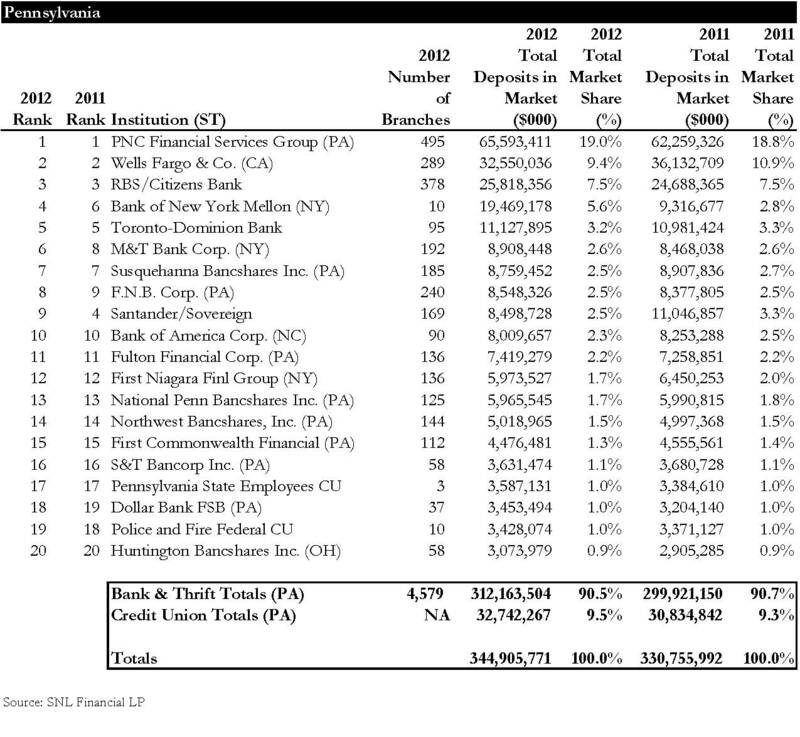 All PA CUs combined have the same in-state deposits as Wells Fargo, and half that of PNC. 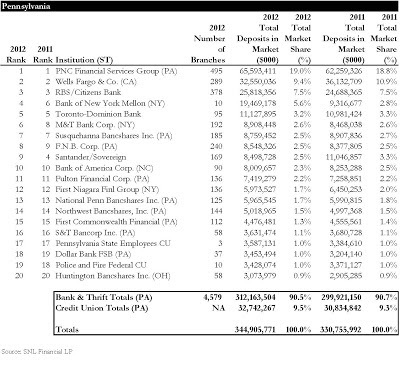 There are only two CUs in the state's top 20 in deposit market share. Does the banking industry dedicate disproportionate strategic decision-making, marketing and lobbying resources fending off CU competition? Because when I look at the above table, it's clear where a community bank's strategic focus should be. And it shouldn't be on the Locomotive & Control Employees FCU in Erie. What is this table telling you?